Send funeral flowers with Flower Station. Choose from carefully selection flowers and arrangements, suitable for funerals. Order online or call our customer service team who wil lbe happy to assist you. Funeral flowers delivery is something that we have learnt how to cope with best over the years, and really there is no substitute for experience. We realize that the sentiments behind floral tributes are stronger than at any other flower giving occasions and we always give priority to any sympathy flower arrangements that go out of our florist shops. Funeral flowers also tend to be quite bulky and large and you will want a UK florist that knows how to handle these properly and get it to the designated destinations with minimal fuss and maximum professionalism. 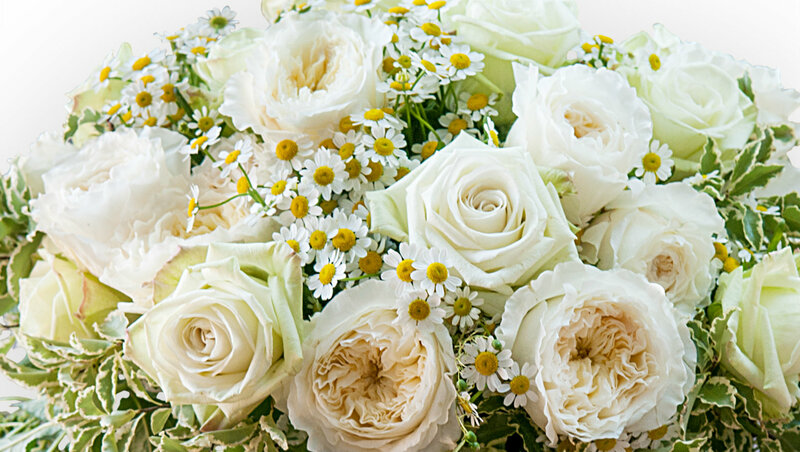 Here at Flower Station you will not only get these services, but you can rest in the knowledge that your funeral flowers have come straight from our flower growers in Holland, ensuring utmost longevity. We offer dad funeral flowers arrangements, mum funeral flowers letters, nan funeral flowers letter or any writing in flowers for that matter. You may choose a specific time delivery on all funeral items. When ordering sympathy flowers or funeral flowers it is very important to give us as much information about the funeral flower order as possible in the instructions box. For example, if the funeral flowers are being delivered to the funeral director, please include the name, full address and their telephone number. Most of all, we will not accept any funeral flower orders without your phone number, and as long as you provide this and we can contact you; your order is still guaranteed to proceed as wanted. If you are not sure about any detail of your order, or if you simply need a professional florist opinion, you can call our headquarters at our main London funeral florist on 020 7724 7525 at any time (or just use our contact form). If you are sending a floral tribute at a time of the flower recipients loss, remember that these funeral flowers will be a welcome reminder of good memories and times spent with the deceased and are certain to provide courage and comfort to prevail over grief.